Hulu Original Studios has recently joined forces with the thriller film factory Blumhouse Productions to launch an ambitious twelve-episode series of horror flicks with one holiday-themed installment released each month. 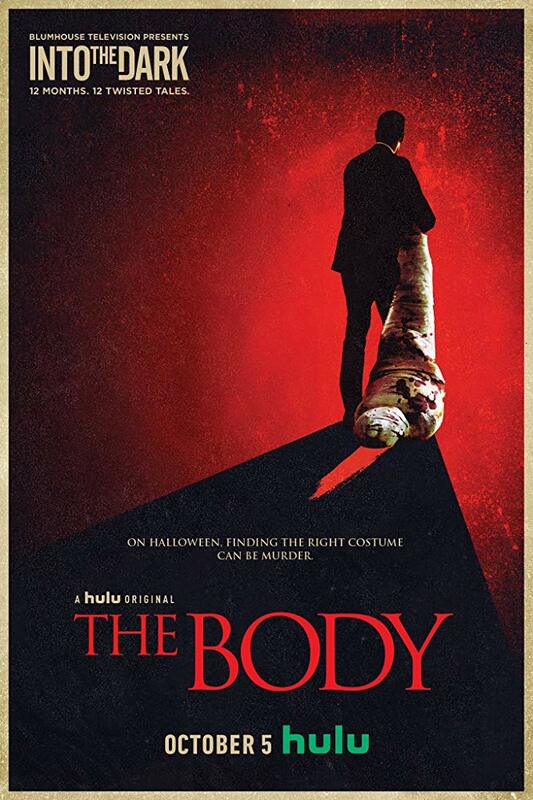 Appropriately enough, the October 2018 episode, The Body takes its inspiration from the annual “trick or treat” festival that has lent itself to numerous cinematic incarnations. It is October 31st in downtown Los Angeles. Contract killer Wilkes (Tom Bateman) has just offed a Hollywood celebrity and has just four hours to deliver the corpse to the man who hired him. A major obstacle has suddenly been placed in his path: his SUV has been pranked and all of its tires slashed. If things could not get any worse, a trio of young folks, Dorothy (Aurora Perrineau), Allan (David Hull) and Nick (Harvey Guillen) literally run into the blood-smeared Wilkes and the body that he is dragging behind him. Believing this is all part of a holiday costume, they invite the hitman to a Halloween party, hosted by wealthy Jack Baker (Ray Santiago), the “monster maker.” Wilkes meets Jack’s IT person, pretty Maggie (Rebecca Rittenhouse) decked out as Marie Antoinette, and the young woman takes an immediate fancy to the handsome Englishman. The friends soon discover that the body is real, and Wilkes is a killer, when he plants a knife in Nick’s forehead. Maggie accidentally sets off an alarm and as the other friends flee, she and Wilkes get locked in a boobytrapped party room. Jack rushes out of the building and brings back a cop who accidentally shoots Maggie, and then gets his throat cut by Wilkes. Jack, Allan, and Dorothy escape with the body in tow, as Wilkes and Maggie try to track them down. Using Wikipedia on his smart phone as his knowledge base, Allan comes up with a detailed plan to destroy the corpse beyond recognition. After stopping at a nearby bar, Maggie cleans herself up and decides that Wilkes has everything that her previous boyfriends have lacked: looks, brains, sophistication, and lots of money. The Body now becomes a race against time: will Jack, Allan, and Dorothy dispose of the dead man before Wilkes finds them or will they become his next victims? This first entry of the Into The Dark horror series blends blood and gore, murder and mayhem, and dark humor with a soupçon of an unlikely romance. Director Paul Davis and his co-writer Paul Fisher adapted this script from their previous 17-minute film with the same title and main characters. Tom Bateman is an unflinchingly cold-blooded killer who will stop at nothing to deliver the goods. On the other hand, his younger colleagues are no more than stereotypical twenty-somethings that unwittingly put themselves in the kind of jeopardy that made old-school horror films so drive-in theater-friendly. 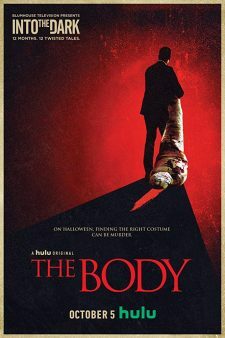 Clocking in at slightly under an hour and a half, perfect for the attention span of most millennials, at times The Body reminded me of the Final Destination franchise but, like the corpse that gets dragged around for most this film, this Hulu Original effort gets dragged down by a less than compelling storyline. A somewhat slapdash start to a series that I hope will improve with time.